The history and human heritage associated with glass working is a lengthy one. Boasting over 3,600 years of documented evolution as an art form, glass is something we rarely think about due to its ubiquitous nature. However, it is a material integral to everyday life. From the windows in your home and car to the lightbulb above your head, glass is, quite literally, everywhere. As an art form it is associated with fragility or vulnerability. But, glass is remarkable because it can only be manipulated with temperatures at or above 2,800 degrees fahrenheit. As such, it is a material that requires strength, respect, and adaptability. Not Fragile at the Center for Contemporary Native Art at the Portland Art Museum is a unique collection of glass works created by some of the Pacific Northwest’s premier Native artists, including Joe Feddersen, Dan Friday, Lillian Pitt, and Brittany Britton. The Center for Contemporary Native Art serves as a dedicated gallery showcasing the perspectives of working Indigenous artists. Not Fragile is currently on display through June 9th, 2019. As you enter Not Fragile your eyes are met by an unexpected object, a mass-produced form glittering under a carefully placed spotlight. Brittany Britton is a Hupa tribe member, multimedia artist and Art History professor at the College of the Redwoods. Her piece What She Carried/ what I brought takes the humble aluminum fold-up lawn chair and exalts it with thousands of hand-sewn glass beads. Seed beads are commonly used to adorn the regalia of Native Americans for ceremonies and celebrations. Seed beads measure somewhere between 1.8 mm and 2.2 mm; they are so small, that applying them artfully takes years of painstaking, time-consuming practice. Britton’s piece was created in honor of her grandmother and her favorite pow-wow chair. 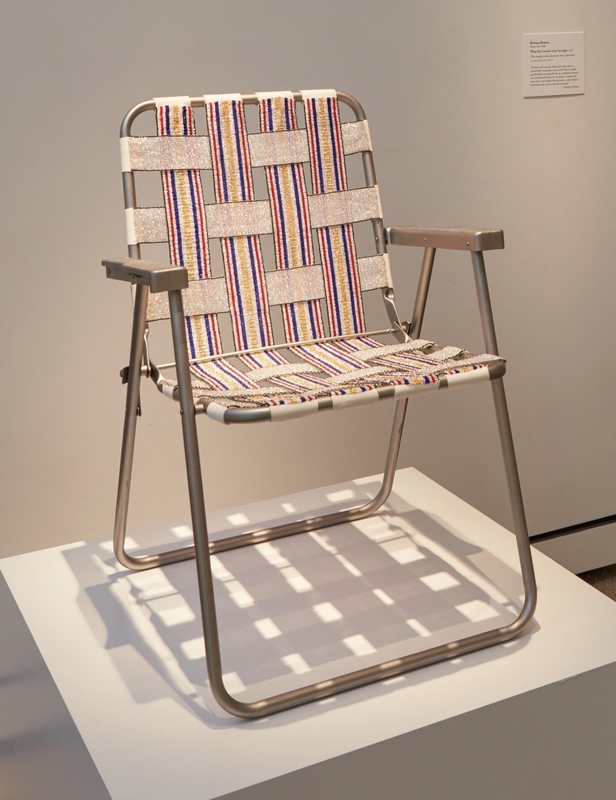 Through this act of sentimental decoration the artist upends the assumed cultural value of the classic aluminum lawn chair and raises it to the level of a throne. Britton’s act of adorning this seasonal object demonstrates the inherent adaptability of Indigenous life. Before contact with the fur traders, the Indigenous tribes of Oregon did not use glass beads in their traditional crafts or garments. Once the Hudson Bay Company entered into trade with Oregon and Washington tribes, glass beads imported from Italy and France were incorporated into indigenous fashions. During this period, coastal tribes also gained access to Cornflower Blue dye through the Hudson Bay Company, which they incorporated into their iconic totem pole designs. Flash-forward 200 years—one can see how tradition both remains and evolves with social and cultural change. While colonialism destroyed many customs, new ones were born. Native American beading is now considered some of the finest in the world, as evidenced by Vogue’s recent feature of Indigenous fashion designer Jamie Okuma’s exquisite beadwork,. Colville tribal member Joe Feddersen is also featured in this exhibition. Feddersen is regarded as one of the Northwest’s most prolific Indigenous artists and is represented locally by the Pearl-based Froelick Gallery. 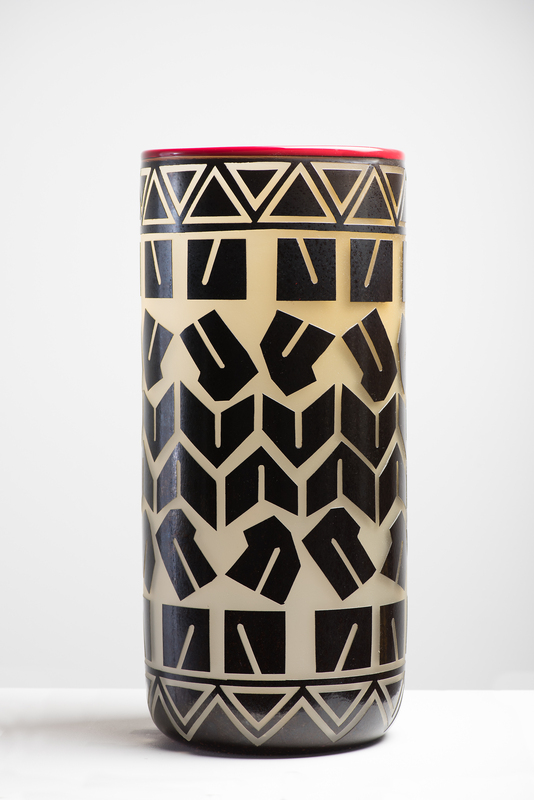 His contribution to Not Fragile is an oversized vase with precisely rendered geometric designs that enrobe the entire form. The contrast and graphic application immediate entice the eye to inquire further. Feddersen began as a printmaker and became known in the 90’s for his patterned imagery. He began to experiment with glass in the 2000s. All of his works embody the inherent duality of being an Indigenous person in contemporary society, manifesting a physical mixture of settler influence and Native heritage that cannot be erased. Throughout each medium, Feddersen’s unique fingerprint is present in the work, I have never personally seen a piece by him that didn’t immediately lure my gaze. His evolution as a creative is emblematic of Indigenous culture. Resilient, not fragile. Bold, not weak. Powerful and adaptive. Joe Feddersen, “Agressive Attitude” (2017-2018). Blown and sandblasted glass. Across the room from Feddersen’s work is an orange-green beacon in the form of a bear, it is no wonder they chose it for all the museum PR materials. 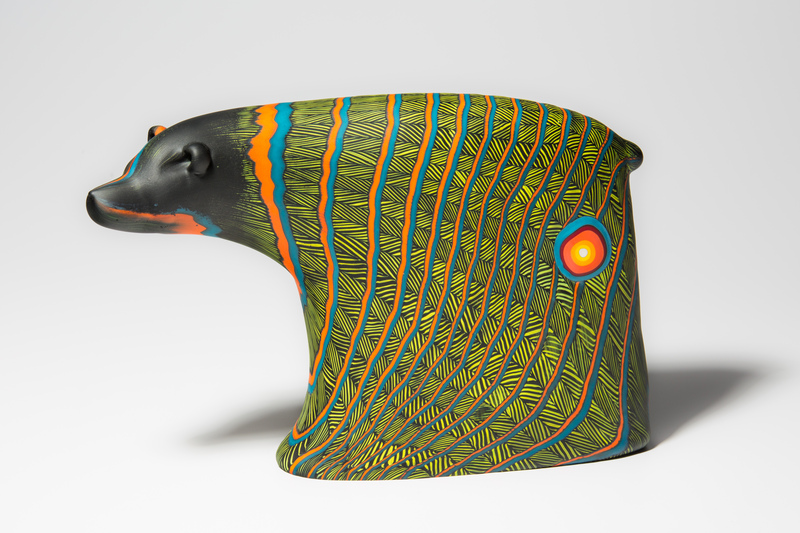 Dan Friday’s Lummi Lightning Bear is a stunning piece of furnace-sculpted glass with vibrant patterned canework. Caneworking is a specific technique in glass that involves assembling multiple pieces of “cane” (glass that has been pulled into long, thin rods) to create intricate patterns on blown glass. As the artist explains, “The Bear has been an important spirit to my family, from my great grandfather’s totems to my father’s drum…Hopefully with the contemporary medium of glass, I can help bring my ancestor’s forward.” Friday’s sentiment echos the work of all of the artists featured in this exhibition, a desire to bring elements of their ancestors and elders forward, in an act of remembrance and survivance. Not Fragile’s confluence of Indigenous makers and glass creates an interesting space for dialog about the survival of culture and tradition. This exhibition demonstrates how the residue of colonialism endures in contemporary Native life. From the influence of trade on our crafts, to the introduction of new technology, ancient customs remain and adapt. Indigenous artists have fought for generations to be recognized as contemporaries and some would argue that Indigenous artists are still considered “outsiders” within the institution of fine art. For example, “Primitivism” as a designation in art creates inherent separations between the works of European prehistoric peoples and those of non-white descent. The concept of Primitivism arose most forcefully during the Modern Art period, with artists like Pablo Picasso and Paul Gauguin appropriating the aesthetics of lesser-known artists of color. The Museum of Modern Art in New York was panned for its 1984 show “Primitivism in 20th Century Art: Affinity of the Tribal and Modern” but the legacy of this misguided concept is difficult to escape. The cannibalization of “foreign” cultures to feed the appetites of European elites remains some of the most celebrated art of the Modern era. The Pacific Northwest is home to one of the largest populations of Indigenous people in the country yet it is rare t0 see the traditional styles featured in our public art or museum spaces. The Portland Art Museum has long acted as a steward for an extensive collection of artifacts from Indigenous peoples from Oregon and beyond. In recent years, the museum has received major grants to expand the collection of contemporary Native American art and just last month hired Kathleen Ash-Millby to be the new curator of Native American Art. The city and its inhabitants can only benefit from seeing more from the tribal makers in our midst. The works featured in Not Fragile cannot be reduced to their aesthetic power. Their very existence is political in nature. Each piece represents the confluence of tradition and contemporary life, demonstrating the continuity of cultural production from generation to generation. The qualities of strength, respect, and adaptability so demanded by glass craft have been demanded of Indigenous communities for centuries. Each piece in this exhibition is a direct response to colonial ideologies that linger in the art institution and present-day American culture. Nonetheless, all of the works featured in this exhibition bespeak a level of mastery and craft, and using new forms to create old forms and vice versa. Stephanie Littlebird is an Indigenous artist, writer, and maker based in Portland.